Avazzia is FDA-cleared for the symptomatic relief and management of chronic, intractable pain and adjunctive treatment in the management of post-surgical and post-traumatic pain. It is available by prescription only. Avazzia devices work to relieve pain - chronic and acute - without drugs or surgery. People have used it for chronic back pain; fibromyalgia; pain associated with sports such as foot, tendon and calf pain; plantar fasciitis and heel spurs; pain connected with neuropathy, especially for diabetics; aches and pains caused by repetitive injuries, such as carpal tunnel syndrome; pain associated with physical therapy, especially after surgery for knee or hip replacement; and back pain associated with travel or work. The body has an inherent capability of maintaining its own health and function and communications via microcurrents. (2) Over the centuries, Western medicine has focused on pharmaceutical cures for illness and damaged tissue. Avazzia takes technology that has been known for decades and brings it into the 21st century. There is no danger in overdosing with Avazzia. (3) Because these devices include interactive responses, the body will not become habituated to the microcurrent nor “accommodate” (become unresponsive to) the microcurrent. 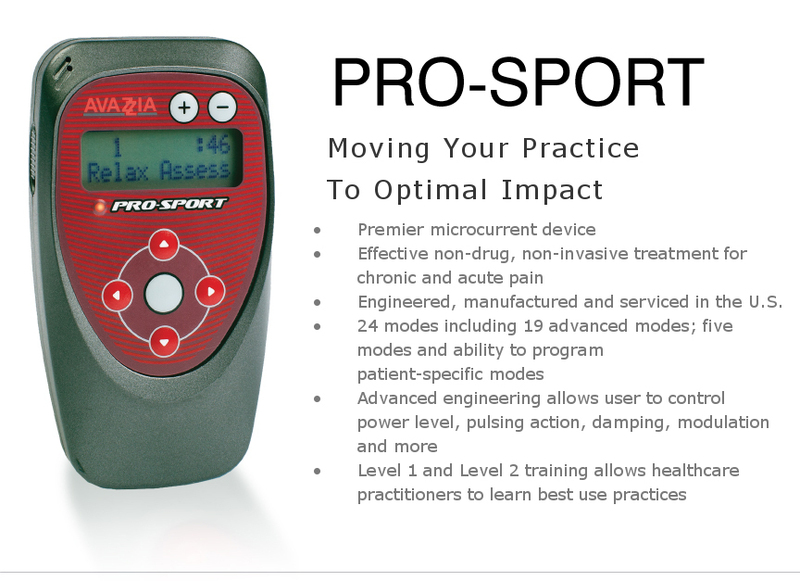 Avazzia devices put the control of your pain in your hands. It’s important for a physician or other healthcare provider to assess your medical condition and history. (4) Once it is determined Avazzia is right for you, you take control of your health and your pain management. "I've had lower back pain for years. I got a BEST-RSI and at first used it every morning for 20 minutes, with pads placed just above my hip bones. Now, four months later, I have no back pain, don't wake up because of back pain like I used to, and actually, the pain I had in my knees is also diminished as well. 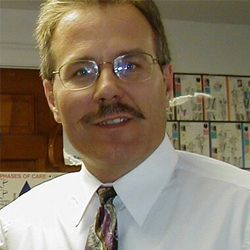 I just use the BEST-RSI once or twice a week as needed for any pain that returns." After spending eight hours a day using a computer mouse, I began suffering from severe numbness in my right hand and arm. I was introduced to the Avazzia device and began seeing improvement almost immediately. Within six months I was totally symptom-free and able to avoid surgery (which I was told was my other option). Since then I have used the device to relieve the chronic neck and shoulder pain that has seriously impacted quality of life for my entire adult life. Nothing I've tried before has been as effective. 2. Wolcott LE, Wheeler PC, Hardwicke HM and Rowley BA (1969). "Accelerated healing of skin ulcer by electrotherapy: preliminary clinical results". Southern Medical Journal 62 (7): 795-801. 3. Contraindications of Avazzia device are demand-type cardiac pacemaker and pregnancy. Stimulation should not be applied over the carotid and sinus nerves. Stimulation should not be applied over the neck or mouth. Severe spasm of the laryngeal and pharyngeal muscles may occur, and the contractions may be strong enough to close the airway or cause difficulty in breathing. Do not use while sleeping. See other warnings and precautions in the Owner’s Manual. 4. Do not use device for undiagnosed pain syndromes until etiology is established. Caution should be used for persons with suspected or diagnosed heart problems. Caution should be used for persons with suspected or diagnosed epilepsy. Because Avazzia features an interactive response, the microcurrent signal is constantly being adjusted to changes in tissue characteristics. Thus the body doesn’t “habituate” or “accommodate” the microcurrent signal. The device measures tissue response and adjusts the microcurrent signal. In surveys, users report that using Avazzia treatment lessens pain, improves sleep and dramatically increases users’ ability to return to daily activities. Avazzia uses two AA batteries and all of the above methods to conduct microcurrent to the patient - onboard electrodes, lead wires with pads or accessories such as Y-electrode and pencil electrode, and fabric-like options including wraps, gloves and socks. Avazzia’s proprietary software and microchips mean a better engineered, more effective treatment method than a traditional TENS. Ancient Egyptians used electric eels to “shock” people back to health - probably the earliest known tie between medical treatment and what is now called electrostimulation or neurostimulation. Much later, in the 1800s, electricity delivered by wires was a new phenomenon and medical care in the U.S. was unregulated. Doctors, healers and common crooks were making wild health claims based on electrical stimulation of various parts of the body. In the Soviet Union, medical research included microcurrent. SCENAR (Self-Controlled Energo Neuro Adaptive Regulation) was developed for the Soviet space program to deal with issues of space travel. In the 1970s, a team of doctors and scientists, based at Sochi University, developed treatment that was energy efficient, useful for many health issues, portable and non-invasive. At the same time, some scientists in the West, notably Robert O. Becker, MD, a professor with State University of New York and researcher at the VA Hospital in Syracuse, were conducting research on the body’s response to electrical currents. Becker wrote the seminal book about the topic in 1985, The Body Electric. Among those in the West willing to explore options other than the pharmaceutical-chemical track of U.S. medicine, it is considered foundational to understanding the use of electricity to heal the body. Avazzia takes the neurostimulation technology of the past and brings it into the 21st century. Using proprietary software and a high-performance microcomputer chip, different microcurrent wave forms and interactive output characteristics, Avazzia products are to the old-fashioned devices what digital music is to the Victrola. Tim Smith, who developed Avazzia BEST technology, previously spent a career with Texas Instruments where his innovations included technology still used in space flight, military jets, telecommunications and transportation. What is Avazzia BEST Technology? 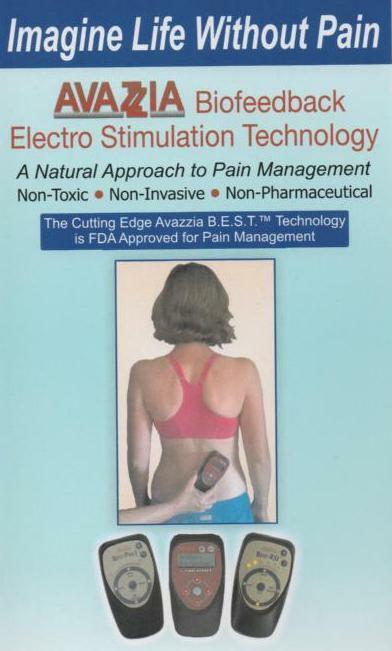 Avazzia BEST (Best Electro-Stimulation Technology) devices were developed as simple, easy-to-use, hand-held devices for non-pharmaceutical, non-invasive pain relief. BEST devices produce microcurrent impulses, transmitted through the skin to interface with the body’s internal peripheral nervous system for the purpose of therapeutic intervention. BEST devices react to the body’s response to the microcurrent stimulus. With each response, the electrical properties of the tissue change. The device detects changes and responds, resulting in the very next signal being modified. This is possible because Avazzia BEST products use high-speed microprocessors, which establish a “cybernetic loop” between the device and the body’s tissue.